It’s amazing what sticks out in my mind. While I was planning my trip to Boston, I was doing the usual bit of research when I remembered a Food Network segment on a Cambridge pub named Grendel’s Den. I don’t recall the pub being anything special, I think it stuck with me because of the name. Regardless of its origins, nearly six years after seeing it on TV, I was going to make sure and pay Grendel’s Den a visit before I left Boston. Taking a seat outside, you couldn’t have asked for a better fall day. 60 degrees, sunny, the leaves had begun to change, and there was even a pretty decent guitarist playing in the small, adjacent park. However, disappointment soon reared its ugly head as I found out that Grendel’s Den was out of Cambridge Ale and their season special appetizer, Bavarian pretzels, was mysterious unavailable. 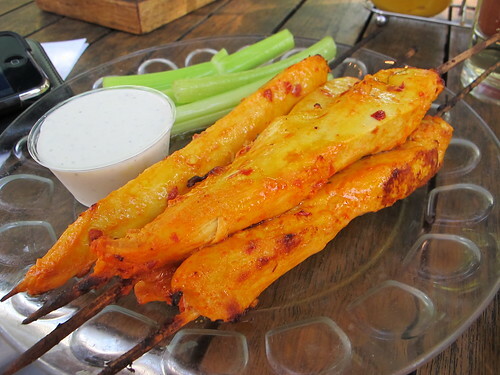 No matter, an order of sambal chicken skewers would work just fine. Expecting a few paltry strips of white meat chicken on a stick, imagine my surprise when I saw my order of sambal chicken skewers. Consisting of few huge strips of white meat, I’ve never had an order of grilled chicken this juicy and well cooked. Flavor wise, it tasted a lot like buffalo sauce with a touch of lime and Asian flavor. As for the side of ranch and celery, the chicken was damn good with the ranch but it only served to reinforce the idea of buffalo sauce. 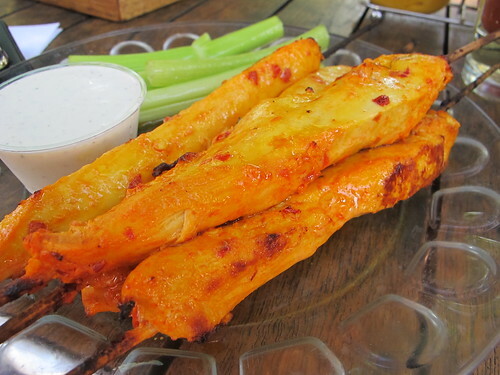 I only wish that all buffalo wings would be this juicy. 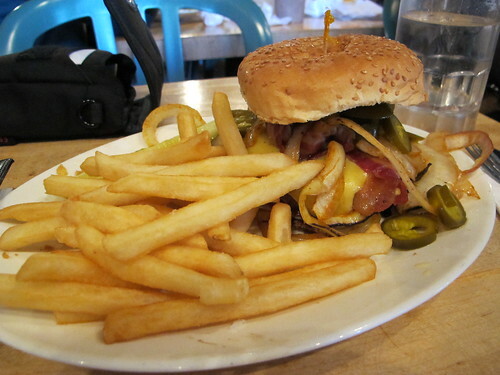 I expected the same oversized but well cooked portions would carry over to my Alpine Burger entrée, but that was not the case. 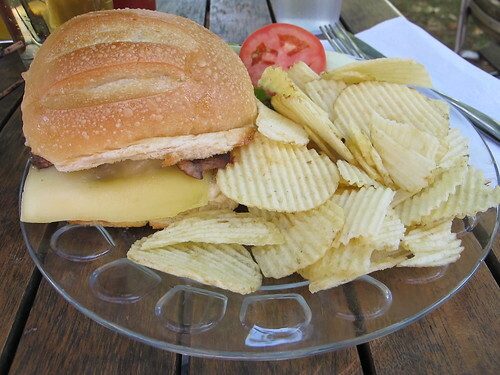 That’s a pretty poor patty to bun ratio. 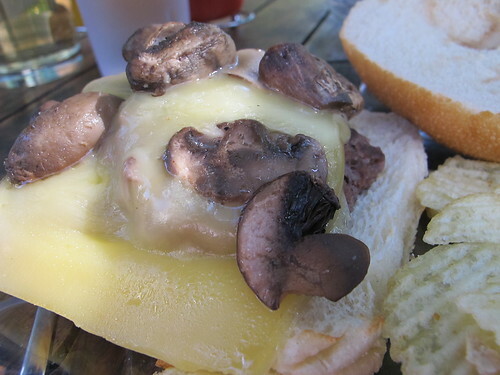 Parts of the slice of raclette cheese were nicely melted but the rest looked as slapped on as the mushrooms. 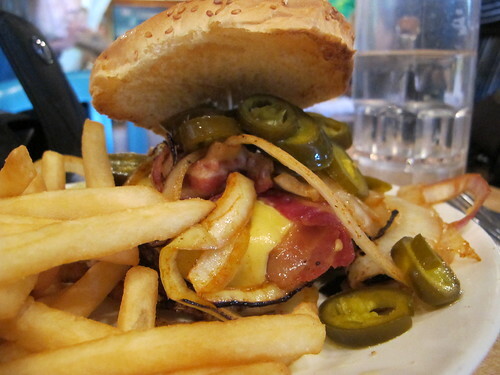 When it comes to burgers, looks are not always the most important part of the equation but biting into the Alpine burger, every other component fell flat as well. 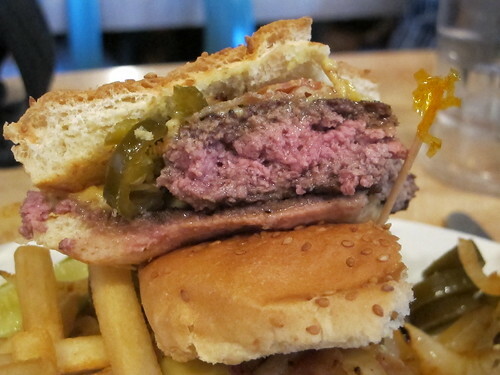 This burger was little more than two odd patties with no discernible taste. There was no seasoning, no beefy flavor, and they were cooked to death. This wasn’t even worth eating. Six years and how did it end? Well, outside of some pretty good chicken skewers, pretty poorly. I’m not exactly sure what I was expecting from Grendel’s Den, but the results were not inspiring. From the looks of other sites, the spinach pie was the thing to order, but that’s a mistake I’ll just have to live with. However the story did not end here. 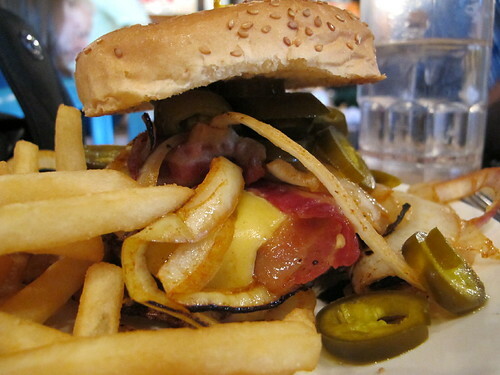 Having barely touched my burger, I decided to look up another Cambridge institution, Bartley’s Burger Cottage, but that will come later. You would think that at eight on a Monday it would be a pretty easy to find a seat at a restaurant. At least, that’s what I thought as I put my name down for a spot at Neptune Oyster. I imagined that it would be a fifteen-minute wait, my number would be called and I would soon be dining on freshly shucked oysters and lobster rolls to my heart’s content. Sadly that was not the case. After an hour of waiting and wandering through the North End, I walked back to Neptune Oyster to find that a table for one still wasn’t available. Eventually, a sympathetic hostess made some room at the bar and I was able to plot my course on a journey through Neptune Oyster’s menu. 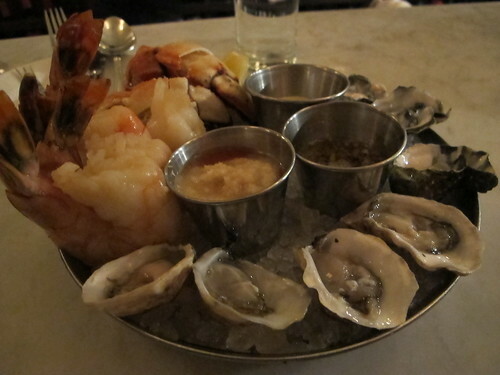 After watching the shucker behind the bar work her magic, my platter of cold seafood was set in front of me. Four shrimp, two Johah crab claws, and eight oysters may seem like a lot for one person, but after waiting for an hour, I was amazed that I didn’t order more. Shrimp cocktail, in my opinion, when done well, is one of the best appetizers available and Neptune Oyster does shrimp cocktail very well. The shrimp were large, juicy with a touch of lemon flavor, and carried an ever-satisfying snap with each bite. The Kusshi oysters were smaller and brinier than the kumamotos, but just as buttery. 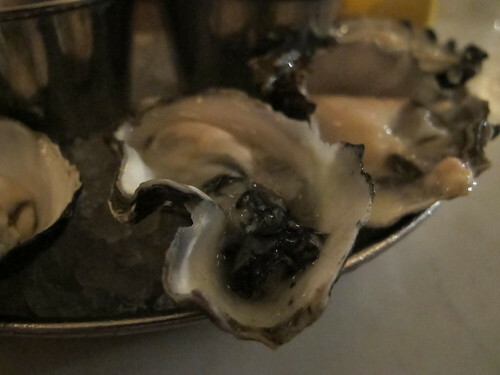 Kumamoto oysters, tied with Apalachicolas for my favorite, were small and buttery as always. 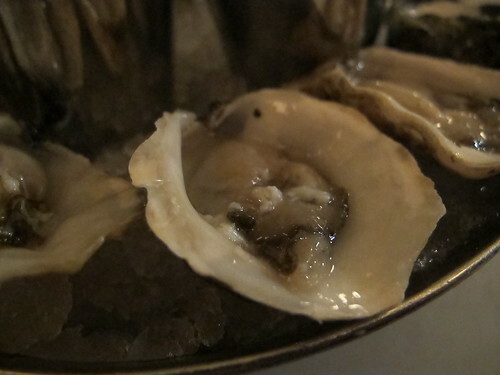 I realize that neither of these are Massachusetts oysters, shame on me, delicious shame. The Jonah crab, sweet and perfectly complimented by the mustard sauce, was an excellent way to round out the cold portion of this meal. If there was one downside to the plate it was the mignonette, there was nothing particularly wrong with it, it just paled in comparison to the heavy horseradish flavor of the cocktail sauce. 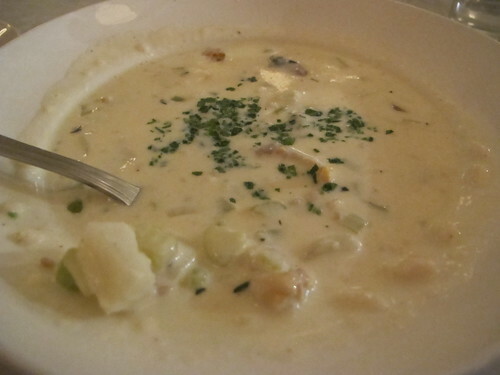 If there was a disappointing section of the meal, it came in the form of the clam chowder. 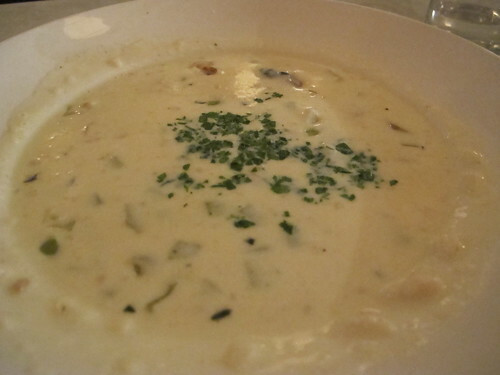 Thinner than I was expecting, this chowder came with a healthy dusting of chives. The variety of textures particularly the crunchy celery and well-cooked potatoes were welcome features but the star of the dish was a let down. Instead of clams with every bite, this bowl was populated with a few big, chewy strips of clam meat. 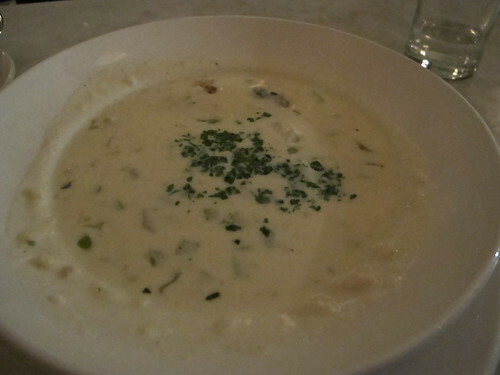 Far from the worst bowl of clam chowder I've had, I was expecting more from Neptune Oyster. 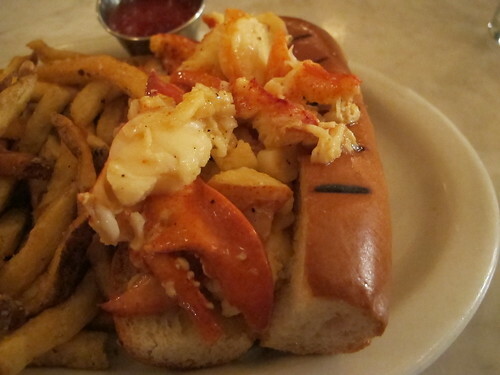 Saving the best, or at least the richest for last, the Maine lobster roll finished out the meal. When ordering, I had the choice of served hot with butter or cold with mayo, and who would choose mayo over butter? At first this was possibly the most glorious sandwich I had ever seen. 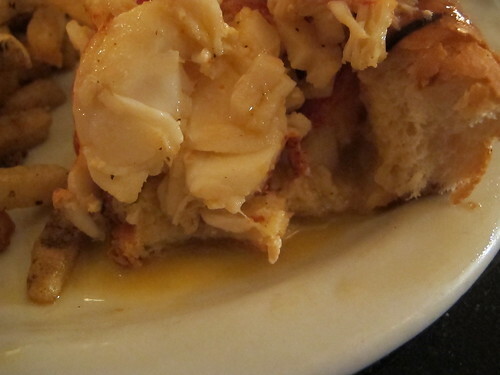 The roll was toasted from the grill and was simply overflowing with butter drenched lobster. With the first bite, I came to know the true definition of excess. The lobster was moist and sublime, the butter rich and ever so lightly toasted, and the roll provided just enough crunch to hold it all together. 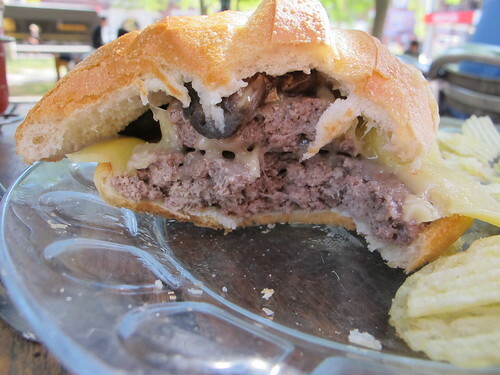 However, it became readily apparent that this was not a sandwich to linger over and savor. The roll, soaked from the river of butter, became soggy and quickly started falling apart in my hands. I did my best to keep it together, but there was too much butter, too much lobster and too little time. 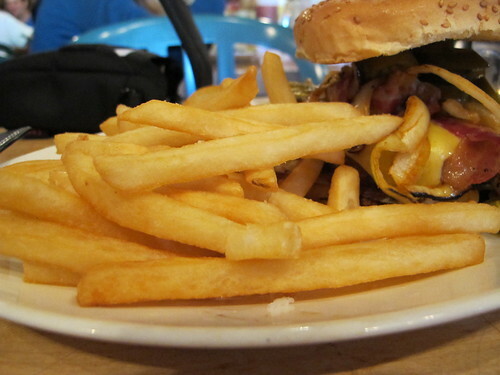 As for the fries, they were all well salted and quite tasty but it was an odd mix of textures. There wasn’t any particular uniformity, some were small and crisp, other large and limp. 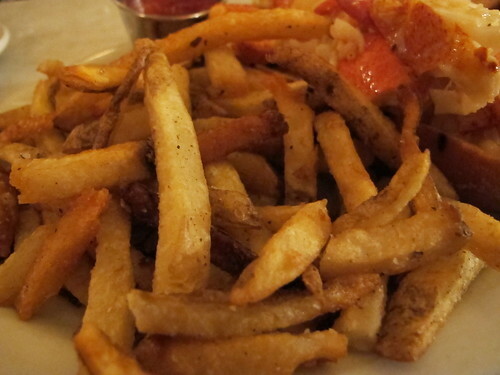 Regardless of their size and texture, they played a distant second fiddle to the lobster. 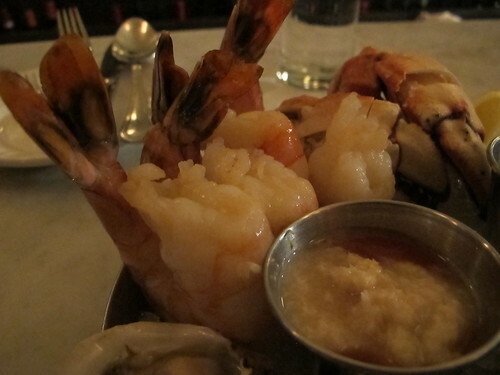 Several hours after I set out from my hotel, I had to wonder if the walk to and wait at Neptune Oyster was worth it. Yes it was. 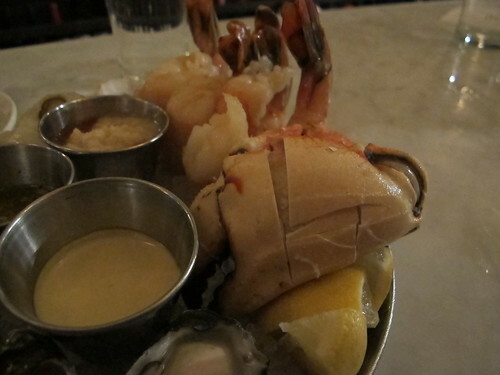 From the cold plate of oysters, shrimp, and crab to the monumental lobster roll it was all divine, even the lackluster clam chowder had its charms. If I’m looking for a negative to this meal, it reads like a list of first world problems. My clam chowder wasn’t meaty enough. 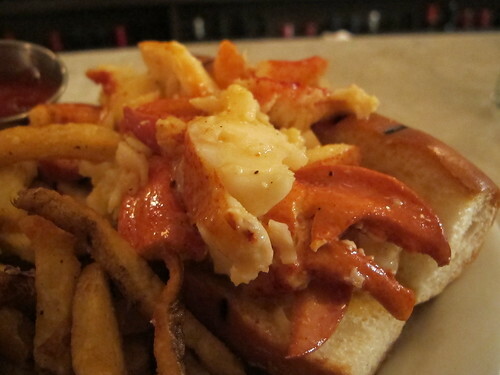 My lobster roll has too much lobster and butter. These are the problems that I love to have. 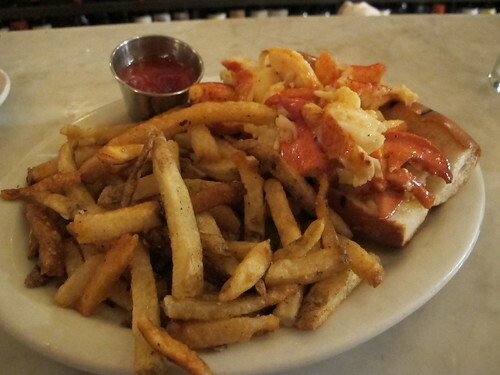 I can only hope that Neptune Oyster hasn't forever spoiled me on lobster rolls. Day three in Boston, and after the gastronomical delights of Hungry Mother and Craigie on Main, it was time to delve back into my Chinese roots with another visit to Chinatown. While dimsum at Hei La Moon had passed muster, I had arrived in Boston with a taste for the numbing heat of Sichuan cuisine. 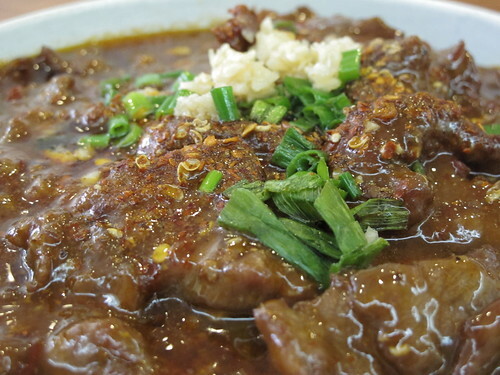 Normally, I wouldn’t have associated this Yankee pot roast part of New England with quality Sichuan food but I suppose that was the point of a year old Serious Eats article. 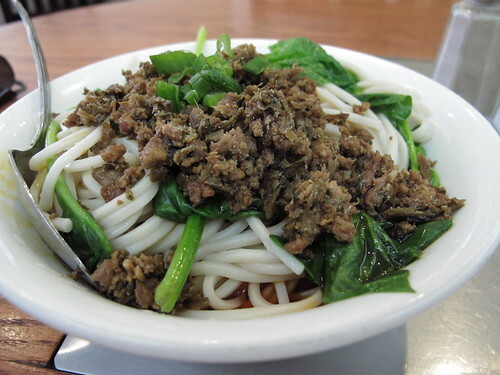 Aptly named “8 Cities and The Dishes They’re Not Known For (But Should Be)”, this slideshow cites culinary goldmines such as Detrot’s burgers, San Francisco’s ice cream, Portland’s pizzas, but most relevant to my interests was Boston and their Sichuan food. Sadly most of the listed restaurants were mostly out of reach. Zoe’s in Cambridge, Chili Garden in Medford, FuLoon in Malden, and Sichuan Garden II in Brookline all sounded delicious but I decided to make the best of my situation and head to the one Chinatown restaurant on the list, New Shanghai. Taking a seat at one of New Shanghai’s hot pot tables, it was hard to know where to begin. With more than 200 items on their menu including hot pot, Sichuan appetizers, and Peking snacks, I could have been quite to content to plan my next month of meals here, but I took a page from Fuschia Dunlop and started with a bowl of Dan Dan Noodles. 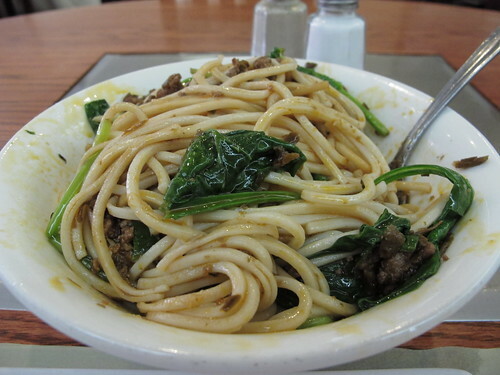 Beneath the virginal white of the noodles lay a pool of chili infused oil that was ready to turn this beef, noodle and green laden bowl into a mess of ma la goodness. Well, that was the hope as I mixed the noodles. Actually the flavors were pretty subtle and frankly a bit bland at first but with each bite, the oily, tender noodles gained more of that dusty Sichuan peppercorn taste. 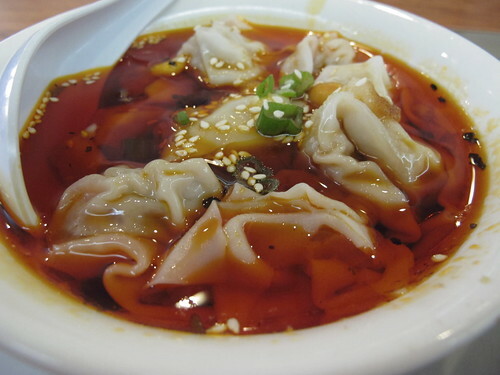 Not content with noodles, an order of Sichuan wontons with red chili sauce was next on my table. These wontons were the best of both worlds; a sesame tinged chili oil whose heat only compounded with each bite and just a touch of sweetness to bring you down to earth. Putzing around with noodles and wontons is all well and good but it was time to step up to the big leagues and prepare for a full on prickly ash assault. This would be the ideal time to swan dive into a bowl of mapo tofu, but I had beef on my mind and boiled beef fillet with red pepper and bean sprouts seemed like a fine choice. Dusted with ground Sichuan peppercorns and minced raw garlic, would this bowl finally be the numbing knockout punch I was looking for? The answer came with my first bite of beef. Almost immediately, a wave of vinegar laden chili melded with the tender filet to form the big, bold flavors I was hoping for. 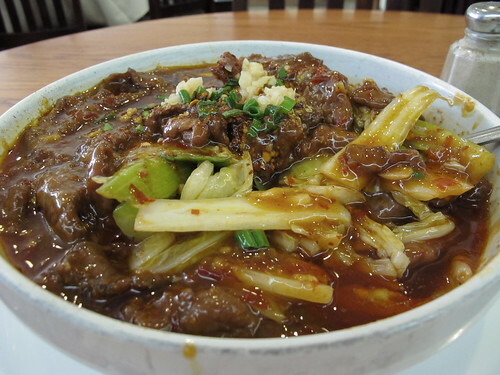 The strips of celery and bok choy played the welcome role of textural contrast and much needed greenery, but the highlight of this boiled beef was the lip numbing excellence of well made Sichuan food. 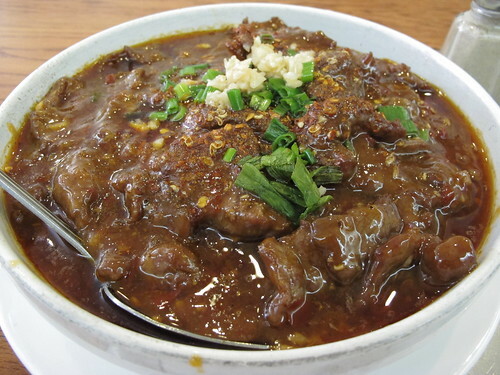 I came to New Shanghai looking for quality Sichuan cuisine and, if this boiled beef is any indication, I found it. Needless to say, I was very happy with the three dishes I tried. 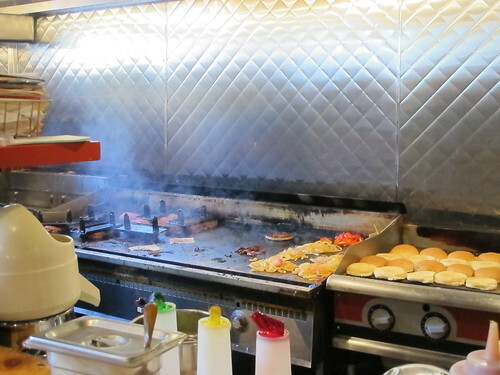 Yes, three out of 200+ is hardly fair to judge a restaurant, but, in this case, it works. Maybe next time I’m in Boston, I’ll have a bigger appetite or company to try more of the favorites like mapo tofu, cumin lamb or Chengdu chicken, but that will have to wait. However, if there is one fiddly detail that bothers me, it’s that New Shanghai charges for their white rice. Charging for good fried rice I can understand, but if you’re going to serve me excellent Sichuan food that begs for rice and then make me fork over an extra $1.25 for the privilege, I’ll do it, but I will complain about it.